From marrying super talented actress Blake Lively to buying stake in craft distiller Aviation American Gin, Ryan Reynolds has had plenty of good ideas in the past. His original pitch for Deadpool 2, however, was not one of them. 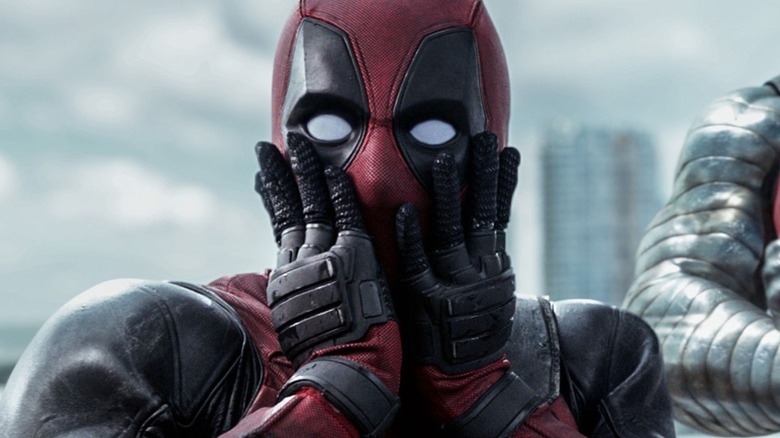 Directed by John Wick and Atomic Blonde filmmaker David Leitch, Deadpool 2 centered around the Merc with a Mouth grappling with his girlfriend Vanessa's (Morena Baccarin) murder, earning his spot as an X-Men trainee, establishing the X-Force to take down Cable (Josh Brolin), and forming a special bond with the fiery teen mutant Russell (Julian Dennison). It was a family film tucked inside a superhero pic — and critics and fans loved it. But Reynolds initially had a much wilder, far sillier idea for how things would go down in the sequel. Chatting with Jimmy Fallon on The Tonight Show, Reynolds shared the bonkers first pitch he gave for Deadpool 2. It was so bad that executives at studio 20th Century Fox shut it down almost instantaneously. "At the time, my first pitch to the studio was not met very well," Reynolds shared. "I pitched them that Deadpool, this was for the sequel … the whole story of the movie would be Deadpool trying to steal the big red chair from The Voice. And they were like, 'That's just the dumbest thing ever.'" Reynolds' second pitch — in which he detailed how Deadpool would team up with Domino (Zazie Beetz), Bedlam (Terry Crews), Zeitgeist (Bill Skarsgård), Shatterstar (Lewis Tan), Peter (Rob Delaney), and Vanisher (Brad Pitt) to intercept Cable's plan to kidnap and kill Russell – went much more smoothly … at the start. The actor relayed that Fox was pumped about the notion of Deadpool 2 carrying an Avengers-type feel with the super group and was even more thrilled at the fact that Reynolds had scored Pitt, who was once in talks to take on the role of Cable, to portray Vanisher. When Reynolds explained that Vanisher doesn't speak, is invisible, and is only seen for "a quarter of a second when he's electrocuted to death," the excitement understandably fizzled out. Although Reynolds' admittedly terrible (chair-ible?) Deadpool 2 idea was shot down, the foul-mouthed antihero did end up getting his leather-clad buns into a famous chair. After Deadpool attempts suicide by blowing up his apartment following Vanessa's death, Colossus (Stefan Kapičić) carries his still-alive body parts to the X-Mansion. There, Deadpool finds Professor X's wheelchair and takes it for a joy ride through the halls of the private estate as he wonders why Colossus, Negasonic Teenage Warhead (Brianna Hildebrand), and Yukio (Shioli Kutsuna) are the only X-Men in the mansion. Now that's what we call a perfect compromise. As Reynolds mentioned in his Tonight Show interview, the home release of Deadpool 2, which features 15 minutes of additional footage through the Super Duper Cut, is available now.